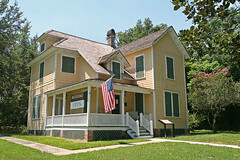 The wonderful Waterhouse Residence Museum is only a ten minute stroll from Thurston House. Owned by the City of Maitland, and restored & maintained by using grants from the State of Florida, city funds and historical society funds, this is a must do tour on your next visit. This 1884 Victorian style home showcases what a middle class family would call home in that era. All furnishings are true to the period, not always the case at house museums. Book your room at Thurston House bed & breakfast, then chart your stroll of the area on our handy local walking map that is given to every guest. Lots to see and do!